Our Easter road trip was intended to draw some inspirations for how and where we may want to live. 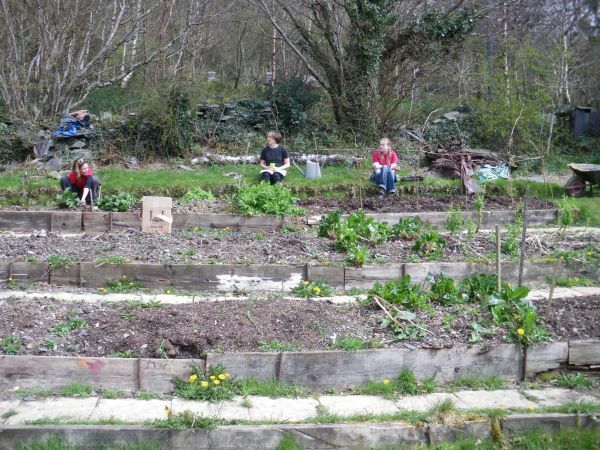 One of the main destinations was Cae Mabon where we planned to help for a day of their Easter working party, and also to find out just what Cae Mabon is. 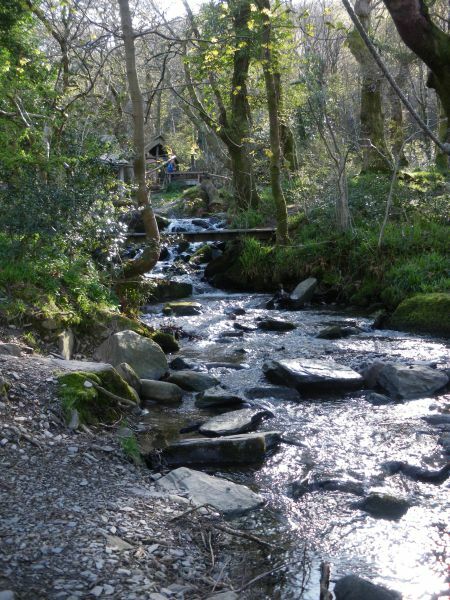 The tale starts in the early 1980s when storyteller Eric Maddern, an Australian by birth who spent the latter years of his childhood in the UK, returned from travels to California, Alice Springs and beyond to settle in North Wales. Twice he saw the cottage in the woods above Lake Padarn but failed to secure it: the third time he made it his. 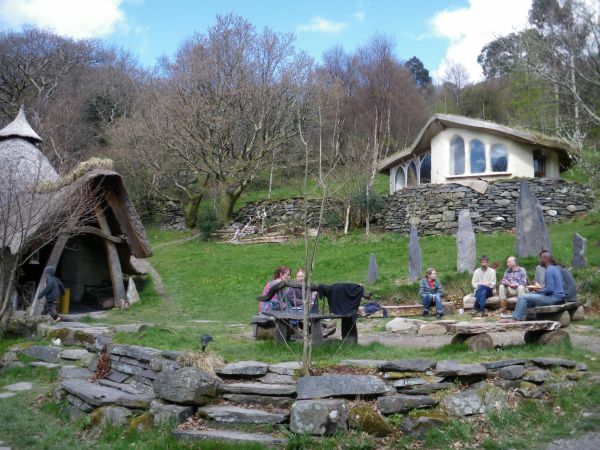 And in the more than twenty years since then, he has transformed the site into a retreat and education centre – but so much more. The site itself is very lovely, that of course is why he was drawn to it so strongly. The small cottage is at the top of the plot which then falls steeply away down to the lake (which technically it doesn’t front on to being separated from it by the Llanberis lake railway). 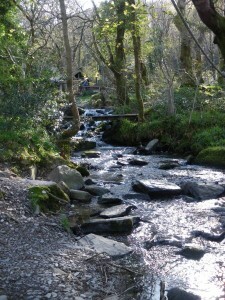 A fast flowing stream rushes down one side of the property and there are plentiful trees. What Eric has done to it has only added to the magic. To support its use as a retreat centre, various accommodations have been built. And what buildings they are: an Iron Age style roundhouse; a small existing barn which has been extended and converted into the kitchen and meeting/eating area; a cob (earth) cottage started as part of an onsite course in cob building techniques run by Ianto Evans and Linda Smiley of the Cob Cottage Company ; and dwellings for visitors to stay in – a hobbit house with a round door, a Swiss chalet, a straw bale hogan, and a cedar cabin. Several of the buildings incorporate interesting energy saving techniques: a rocket stove built into an internal bench so the smoke heats it up rather than venting wastefully straight up a chimney; a cob storage radiator behind a full length south facing window so that it absorbs heat during the day and gives it out during the night; and turf roofs of course. The sustainable living ethos doesn’t end there. The cottage and studio barn are fed by mains electric but the rest of the buildings are lit solely by solar-powered LED lighting. I think Eric was probably driven to fit this after the shock of the first roundhouse burning down due to a stray candle. The toilets are composting. The kitchen waste water is filtered and fed back into the stream and lake. There’s a vegetable garden and chickens on the site (as we would find out when we came to the work party). There are creature comforts as well, notably a wood-fired hot tub next to the stream. We arrived there on Good Friday evening and were sorted out with accommodation by Alison, who was doing a fantastic job of fitting people in. I guess at this stage there were two dozen people on site although this would swell to closer to three dozen by Saturday night. Eric holds a working party for two weeks over Easter to get the site ready for the summer and hopefully progress a few projects as well. Some people were travelling or volunteering their way around the country or world, some were working party regulars or friends of Eric (the distinction blurs over time of course), and some were curious newbies like ourselves. All were friendly. Dinner was simple but tasty – there’s a £5 per day contribution towards food. After dinner, Theo took advantage of the hot tub while a fire was being stoked up in the roundhouse. Everybody gathered, some songs were sung by Eric and then a couple of the volunteers talked about the permaculture course they’d attended at Findhorn, a longstanding community in the north of Scotland. When they’d finished we slipped away to bed. After breakfast, the morning meeting took place in the studio barn where Eric went through all the jobs that needed doing and people bagsed what they fancied. We decided to help out in the garden. I tidied up the shed while Kestrel and The Fairy helped with weeding, planting seedlings and harvesting some greenery for lunch. 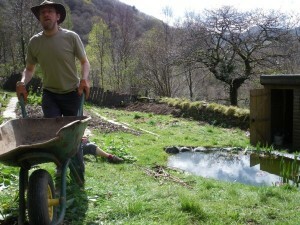 The Fairy and I then settled into our main task, levelling out an area for a polytunnel to sit on. This involved wheelbarrowing a pile of small rocks (sieved out of the soil which had been used for the vegetable beds) and using them to build up the lower edge of the patch against a retaining stone wall – the area used to be full of slate quarries so stone is not in short supply. It didn’t seem like a big pile but it kept us busy until lunchtime. After lunch, we took advantage of the sunshine and had the catch up meeting in the outdoor circle. Being a storyteller, Eric has a fondness for extravagant gestures, although I have no idea why the subject of aeroplanes appears to have come up during the meeting. Anyway, the net result as far as we were concerned was that Kestrel and I would continue levelling the area for the polytunnel. Meanwhile The Fairy would help with some decorative painting in the Longhouse, a bunkhouse which had just had a fresh coat of paint inside. 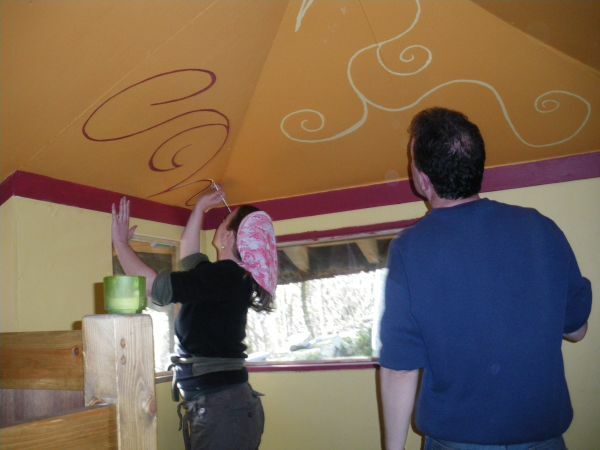 After we’d finished the levelling, I wandered down to the Longhouse to find The Fairy, Mandy and Kevin carefully filling in the swirls they’d pencilled on the ceiling and walls – especially carefully since normal house paint isn’t the best material for detail work! But it looked fantastic and even by association, it felt very satisfying to leave such a permanent mark on Cae Mabon. From there, we helped cook dinner for ever growing number of people – throw some more vegetables into the sauce and put more pasta on! – before a quiet night chatting and reading in the studio barn. We had to be away early the next morning. Cae Mabon is a hybrid. It isn’t a fully fledged community, it’s essentially Eric, Keith and various helpers running a centre. But for the period of the work party it does function like a permanent community and it was really interesting to see how that can happen. 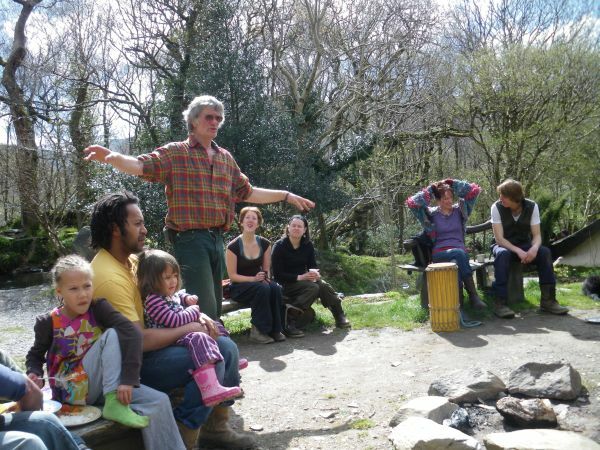 Understanding the dynamics of group living and working is an important part of permaculture. 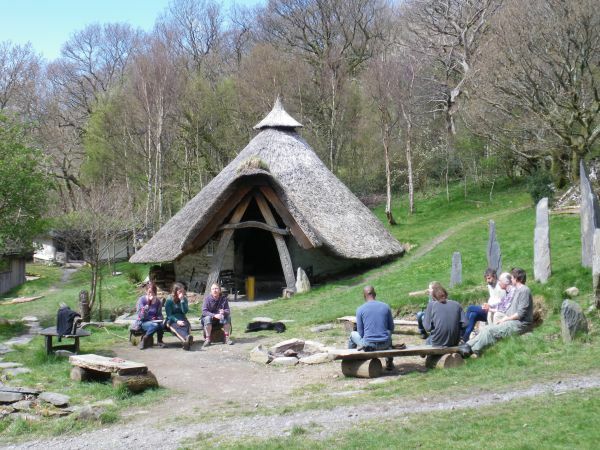 Cae Mabon really flourishes due to the goodwill people feel towards Eric and the place he’s created. One of the volunteers is a permanent resident at the Centre for Alternative Technology and he’d cycled over to spend his Easter weekend helping Eric, and this wasn’t the first time. And he wasn’t the only skilled and talented person making a similar commitment. That speaks volumes for what people think of the place. We were similarly charmed by Cae Mabon the place and Eric the person. I’ve no doubt we’ll be back at some point.